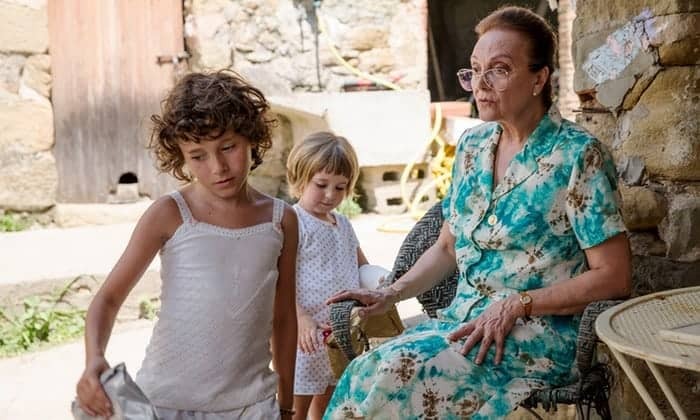 Six year old Frida (Laia Artigas), recently orphaned after the death of her mother, is taken in by her uncle Esteve (David Verdaguer) and aunt Marga (Bruna Cusi), moving from her grandparents home to live with them and her three year old cousin Anna (Paula Robles). Given free rein by her relatives, Anna has fun over the summer, but, clearly traumatised by her mother’s death and by questions hanging over her own health, she also acts out. Films about childhood are tricky. Most writers and directors are some way removed from those times and experiences in their own lives, and so there can be a tendency to write children who sound like miniaturised adults rather than like real kids. This can also come through in performances, with young actors who, however good they may be, have a precocious feel that always makes us feel them acting out a part rather than living into it; reading lines rather than saying them. These, and many other pitfalls, are expertly evaded by Carla Simón in her accomplished autobiographical feature debut. Summer 1993 is a gentle film. The earth shaking moments of drama – Frida’s mother’s death, most of the discussion surrounding Frida’s medical status – are either kept offscreen entirely or dealt with in indirect dialogue. This, however, is not to say that the film lacks emotional punch, quite the reverse. When good news is almost thrown away in a piece of dialogue it still hits hard. What Simón is concentrating on here is focusing that moment on the way that Frida would understand it – she knows the news is good because she has two ice lollies at the same time, and it’s the second part that matters most to her. This seems to be the film’s guiding principal, this is childhood; beautiful moments and difficult ones, as experienced from a child’s eye view. Almost every shot is either from or barely above Frida’s height, so we view the world as she does. Adults are frequently cut off in the frame, their legs being where Frida’s gaze goes by default. They can feel big and imposing, but they’re never scary. Frida says, when her uncle and aunt have to be a bit stricter with her, that nobody loves her. Simón’s camera suggests a different instinct: that Frida feels, deep down, the warmth of all the adults in her life, but can’t always articulate that specific warmth that she now misses. The film doesn’t need to state these things, it simply makes us feel them through its camerawork and through Laia Artigas’ incredibly natural performance. Though the films are very different in feel, the performance that Artigas‘, and indeed three year old Paula Robles‘ work put me in mind of was Ana Torrent in Spirit of the Beehive; not so much in the specifics of their work, but in terms of their naturalism and ability to simply be, without seeming to act. Artigas and Robles are often the only people on screen, and their relationship is fascinating to watch. There was, apparently, something of a power struggle between the two children during casting, which is why they got the roles and forms a key part of how the film unfolds. In one scene they are asked to pick a lettuce. Frida picks a cabbage, but when she’s sent back to try again, takes the lettuce that Anna has picked from her and tells Marga she picked it. It’s playful, but also the beginning of something that escalates during the film. Of course this competition for attention and favour isn’t the whole of Frida and Anna’s relationship and the scenes in which we simply watch them play together are completely naturalistic, even as they are revealing Frida’s underlying feelings. Most interesting in this context is the scene where she and Anna play house, with Frida putting on make up and adult clothes and roleplaying as the mother, the dialogue is funny and perfectly articulates how children, trying on adult roles, talk but it’s also wrenching as we realise Frida is probably playing her own mother and articulating what she misses. Simón is building to something here, but she does so in such an unobtrusive manner, allowing small moments to unfold and build in a way that, despite a running time only a little over 90 minutes, has a languorous approach that contributes to the summery feel of the film. Even when the emotional crux of the film comes, Simón never overplays her hand. The reason for this is likely twofold; first, she knows that the moment has weight without having to force anything but more importantly the key scene is about how an adult explains things for a six year old to process. This hit me hard on a personal level, as did the film’s very last moments. Beyond her perfectly pitched handling of the actors – the adults are every bit as brilliant as the children, with the same sense of complete naturalism and investment in the relationships – Carla Simón has crafted a hugely impressive directorial debut. Her use of camera puts us right inside the story, while finding beautiful isolated images and building a sense of place and of season that is transporting. This is a director to watch for the future.